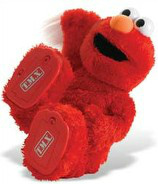 There is a factory in Northern Minnesota which makes the Tickle Me Elmo toys. The toy laughs when you tickle it under the arms. Lena is hired at The Tickle Me Elmo factory and she reports for her first day promptly at 8:00 am. The next day at 8:45 am there is a knock at the Personnel Manager's door. The Foreman throws open the door and begins to rant about the new employee. He complains that she is incredibly slow and the whole line is backing up, putting the entire production line behind schedule. The Personnel Manager decides he should see this for himself, so the two men march down to the factory floor. When they get there, the line is so backed up that there are Tickle Me Elmo's all over the factory floor and they're really beginning to pile up. The 2 two men watch in amazement as she cuts a little piece of fabric, wraps it around two marbles, and carefully begins to sew the little package between Elmo's legs. The Personnel Manager bursts into laughter. After several minutes of hysterics he pulls himself together and approaches Lena. "I'm sorry," he says to her, barely able to keep a straight face, "but I think you misunderstood the instructions I gave you yesterday. Your job is to give Elmo two test tickles."